Perumda Pembangunan Sarana Jaya accelerates Klapa Villlage Rp 0 Down Payment (DP) settlement construction in Pondok Kelapa, East Jakarta. Currently, it has completed topping off phase.
" 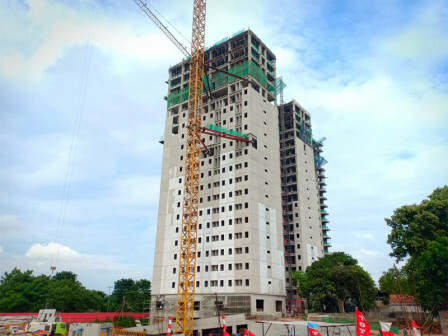 This project is running on time and targeted to finish in the end of July 2019"
"This project is running on time and targeted to finish in the end of July 2019," mentioned Yoory C. Pinontoan, President Director of Perumda Pembangunan Sarana Jaya, Thursday (2/7). Entering rainy season, he hopes current weather condition won't hamper the construction. "Construction reaches 51.86 percent and we start to concrete wall installation, electrical mechanic and plumbing," he added. For information, Klapa Village Rp 0 DP settlement is built on 5,686 square meters land. It is planned to be built up to 21 floors with total 780 units. There are 240 units in studio type, 180 units in one-bedroom type, and 360 units in two-bedroom type.